A little while ago, I organised another #bloggerbookswap. I love these, as I always have a stack of books I've read and would like to pass on to other people who I think would enjoy them. 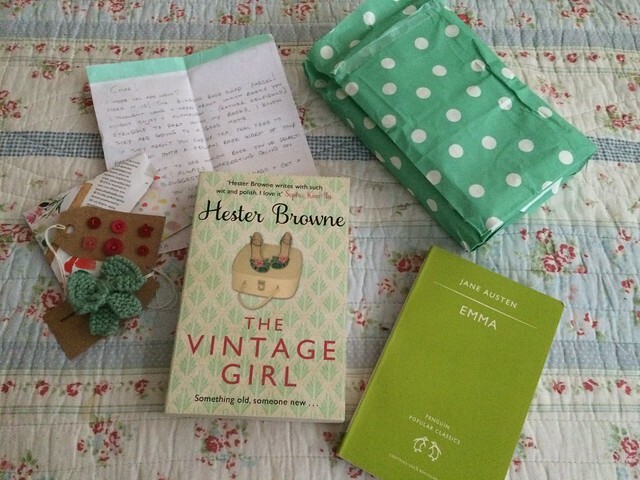 I was paired with Gemma for my swap and she sent me the most beautiful parcel, wrapped up in polka dots. I'm a big fan of passing books on to people who I think will enjoy them. Unless they're very special ones I'm not exactly precious about books and am happy to part ways with them in the hope that others will enjoy them, too. Gemma sent me a couple of books which I couldn't wait to get stuck into. I'm a little ashamed to admit that I've never read Emma, despite the fact that it's a classic. It's definitely next in my pile. I'd not heard of Hester Browne before, but have now read The Vintage Girl and thoroughly enjoyed it. Did you take part in my book swap? Let me know what you received! I got a fab parcel from Alex, four books in total plus some extremely yummy vegan truffles. Thanks again for organising the swap, I'd definitely take part again. Super glad you got some great books and that you decided to give it a go. I'll definitely be organising another in a few months. There'll be others, for sure. I know - I'm disappointed in myself! I'm glad that book is doing the rounds, I do love passing books on. It's next on my list, currently reading a slushy Fiona Walker. I'm glad I'm not the only one, but I do plan to rectify this soon. Ah, I'm so glad you liked the little parcel. Definitely nerve-wracking but with that kind of anticipation you get when you're little and waiting for Santa?